Chainilnk Marketing Platform allows you to craft 1:1 personalized conversations with your customers to help drive customer loyalty to your brand and services. When you engage with each customer on a personalized basis throughout the customer lifecycle, you will improve customer retention, encourage repeat purchases, and maximize the customer lifetime value. Any marketer will tell you winning new customers is harder than keeping your current ones happy. Chainlink Marketing Platform loyalty marketing is a simple way to grow your revenues and keep your customers happy. Target your current customers personalized marketing programs including on-boarding, referral offers, social promotion, and repeat purchase incentives, and up-sells; these will all drive engagement and customer loyalty, growing your customer lifetime value. Chainlink Marketing Platform tools make it easy to create consistent cross-channel loyalty offerings to drive engagement, whether it be via email, mobile, dynamic web pages or direct mailers. Create automated programs to facilitate an ongoing conversation providing your customers with updates on your latest products and customized offerings. 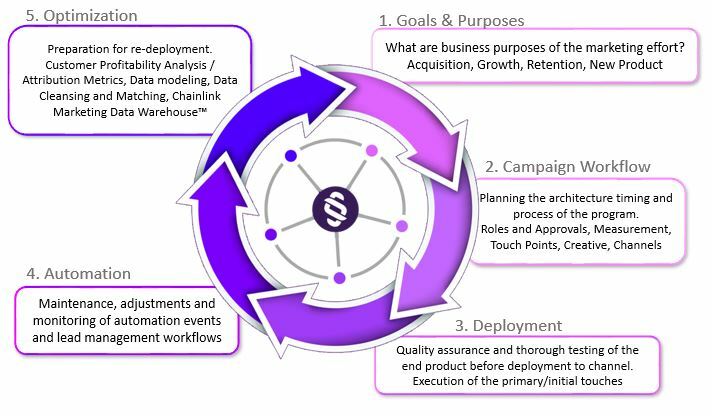 Every marketing interaction is updated and stored in the Chainlink Data Warehouse, so you can create advanced segments and hyper-focused offerings that can be automatically triggered based on any purchase, behavior or engagement. Target you best customers based on custom profile scoring and offer referral rewards or encourage customer reviews. Driving higher customer engagement through your loyalty marketing will lead to happier customers, higher customer lifetime values, and overall business growth.